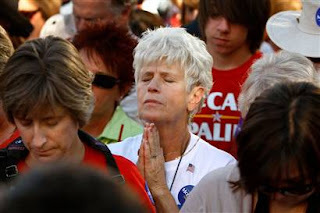 It's an article titled "Praying for Election Day miracles" and is subtitled "Religious Americans turn to a higher power on the candidates' behalf," and this is the photo that accompanies the story before you get to the text. What's the message? It's the same message the media has sent at the behest of the Republican party for the last 28 years--Republicans are the party of American Christianity. Forget that the second paragraph mentions Barack Obama--the first one mentions opposition to abortion, and that means Republicans. The title, the picture and the lede all reinforce the notion that the Republican party is the party of belief. "But Brian," you say, "you're an atheist. What do you care?" I'm also a political realist, and I understand that to win election, you have to be religious. Christian is the most effective, especially in a larger race--atheists need not apply. So when major media outlets reinforce the notion that one party is holier than another, it peeves me a bit, especially when it's as blatant as this. Look, this nation is about 75% Christian, 15% who won't say, and the rest is a mix of the other major religions, which means there's a significant number vast majority of Democrats--pro-choice, pro-gay marriage, pro-social justice Democrats--who are Christians. When media organizations make these sorts of skewed associations between Republicans and Christianity, especially this close to an election, they're sending a false message. I'll be glad when the country gets to a point where questions about faith are considered not only unnecessary, but pointless and rude, but we're not there yet, and until we are, the media needs to do a better job of making sure that they show a realistic view of how both parties are full of religious people.